A wonderful surprise was waiting for me yesterday. 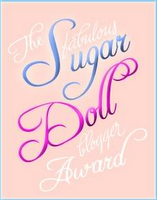 Shar at La Bonne Vie awarded me with the Lovely Blog and Sugar Doll Awards. And Shar's kindness actually got me to take off my cat costume, put down the machine gun, and smile. Now, you know how this goes... 10 things about me that you do not know, and then I share the love with the chosen bloggers. 1. I used to be a champion, state record holding, swimmer, not kidding, I actually was. 2. The first time I met The Boyfriend was after midnight in a nightclub. This tidbit of info is for all the single ladies out there that are told that this never happens. It does and it did. 3. When I was in 6th grade, I developed a horrible bumpy red rash all over my forehead and around my eyes (swimming related). It lasted into 7th grade, this was in addition to buck teeth, too short, too frizzy hair, and being tall for my age, I was teased relentlessly and boys barked at me. I now enjoy looking at photos on Facebook of some of the people that teased me. I will not say anything unkind about how they have 'grown', but will say that karma is clearly a b*tch. 4. I got arrested during a bar fight in New York City on St. Patrick's Day when I was 16. Not something that I'm particularly proud of but hey, pretty cool story to tell the grandkids. 5. I snore. Loud. Like a large truck driving, lumber jacking, fat man loud. I know I said 10 but you get 5. I need to save something for the memoir. Congrats! And thanks for the love up there! And I'm sure there are a lot more people who snore but don't want to admit it. I'm one of those people. lol. Thank you Sarah! I'll get these babies up in a post shortly. Number 3 is so funny! I too get a kick out of old friends on facebook...not to brag, but time has been very kind to me! Takes the old sting out of those catty comments, right? This means I've gotta wrack my brain for 10 little known facts...and right now I've got a cold. I think I should wrack it when it's clear headed, don't you? Who knows what family secrets I could spill in my current befuddled state! First, you had me cracking up so loud with that picture of "you" and the machine gun...then i was honored and touched that you spread your joy and love my way...awwww! Thank you doll! ...and then, bar fight in NYC on St. Patrick's day?? holey moley...I want details!!!! that must have been quite a story! Thanks for sharing the love!!! Awe, thanks girlie....could not have come on a better day. Not sure there are 10 things that my readers don't already know...kind of an open book and junk. I am honored, thank you. I agree totally about karma,the older you get the b*tcher it gets! I hope you were defending the honor of the Irish. I have three lovely daughters and it always sounded like a cowboy bunkhouse at night. The Oscars! I love it! Congratulations!! I can't wait to see all the other blogs you've chosen! Congrats to the winners! Arrested in a bar fight. Excellent. Thank you so much for my award! Thanks for the Love, Sara. You made me (a tired Homemaker Man) recover some pep in my step. I will get these up by tomorrow latest, I think. Oh my, oh my...you added little ole me? I mean I have been absent from reading this week as I was in a rather dour mood that I think writing helped cure...so tomorrow I will come up with my 10...thank you for letting me into your blog because each one I read really adds to my day...What is really odd...I have had a crick in my neck since Sunday morning...how co-wink-a-dink! But thanks for the honor!!! Thanks, Glenda! 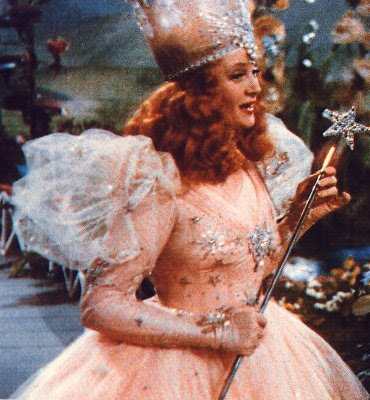 I mean, Sara Louise. I am feeling the love! 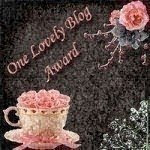 But just as fun is seeing your other winners...yay, new fun blogs to read!